Fever Swamp is a sandbox adventure published by the Melsonian Arts Council following a successful Kickstarter campaign. Designed for use with Lamentations of the Flame Princess Weird Fantasy Roleplay—but compatible with other retroclones—Fever Swamp is a hexcrawl which takes the player characters into the thousand square miles of a foetid, forsaken, disease ridden swamp, itself known as the ‘Fever Swamp’. Perhaps to gain the reward for the safe return of the imperially sanctioned occult scholar, Gert von Hemmer; possibly to confirm the fate of the lost imperial river galley, the Wasser Koenig; or even go in search of a great evil rumoured to stalk the waterways and mires of the fever swamp. They will face constant moisture, unrelenting heat, droning insects, the danger of disease and wounds that fester rather than heal, strange tribes, and the dregs of society. Unlike the first scenario published by the Melsonian Arts Council via Kickstarter, Crypts of Indormancy, there is no hinterland, no world beyond the limits of Fever Swamp. What Crypts of Indormancy hinted at was a world beyond its island archipelago setting, once a colonial possession of an empire of Elves, now occupied by twelve tribes of Island People. The Elves lost their empire long ago, whilst the folk memory of the Island People leaves them with a cultural dislike of the Elves. In comparison, Fever Swamp suggests the existence of the Nilfenberg empire from where settlers and fugitives have come to the village of Clink, either to stay, or make their way into the swamp. Plus of course, the scholar, Gert von Hemmer, and the lost imperial river galley, the Wasser Koenig. No details of the Nilfenberg empire are given, but it could easily be the Empire of the Old World, so that with some effort upon the part of the Game Master, Fever Swamp could be adapted to run with Warhammer Fantasy Roleplay or the ZWEIHÄNDER Grim & Perilous RPG. Whatever setting a Game Master uses, the Fever Swamp needs to be placed suitably far away from the empire itself. 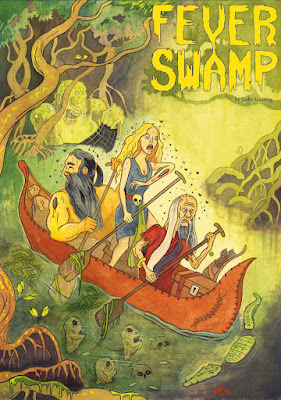 Fever Swamp is slim, twenty-six page hardback done in full colour—mostly green. It has no given guide for the character Levels required to play the scenario, though most foes they will face are of low levels. That said, push too far, explore too far, and there are some truly monstrous creatures to be encountered in the Fever Swamp. Besides describing the fifteen or so locations, it details the various NPCs, encounter tables, new monsters, and rules necessary to handle boats and disease in the swamp. Boats are the only viable means of getting around the swamp and the chances of catching a disease in the swamp are unfortunately high. In addition, Fever Swamp includes two new Classes. One is the Transfiguration Host, a Specialist-type character who is host to a Transfiguration Worm, a creature which seeks new experiences and which grants the host a new ability each time he acquires a new Level. This might be for example, learning a random arcane spell, acquiring razor sharp canines, growing a toxin gland, which enables the host to spit poison, and reversed knees like a bird giving the bird increased speed. The Transfiguration Host is a random character Class in effect, but hosting the Transfiguration Worm and its desire for new experiences does mean that the character has reason to want to leave the swamp, unlike its other inhabitants. The second Class is a treatment of the Shaman, a Cleric-type Class who binds a randomly determined spirit to his service each Level. Each spirit can perform a service for the Shaman once per day, for example, a Tree Spirit who will read the bark of nearby trees to learn of events in the past or recently passed by animals, or a Rot Spirit capable of decaying wood utterly or warding against decay. These Classes are a source of fresh player characters should any die in their exploration of the Fever Swamp as are possible inhabitants of the village of Clink. If there is an issue with Fever Swamp, it is the way into the sandbox, what gets the player characters involved, is underwritten. The likelihood is that the Game Master will need to create his own and strengthen the ones suggested in the opening pages of the book as the player characters very much need a reason to visit and explore the Fever Swamp. Like any sandbox or hex crawl, Fever Swamp is a player-led mini-campaign, which means that the Game Master will need to put a bit more in effort into adjusting to what the players want their characters to do. The small size of Fever Swamp—both as a book and a geographical area—and the self-contained nature of its foetid, boggy, environment, means that this is not as daunting a task as it might have been. The small size also means that Fever Swamp is easy to drop into almost any campaign and with a little preparation, ready to take the player characters into a heart of darkness.